As of 1st July 2014 Astute (Scotland) Limited acquired Evert Print. The directors of Astute are delighted that Bob, proprietor of Evert Print chose us when he decided to retire as we have been supporting Evert Print since 2001 as their print supplier. It goes without saying that we wish Bob a long and happy retirement and look forward to working with our new clients. 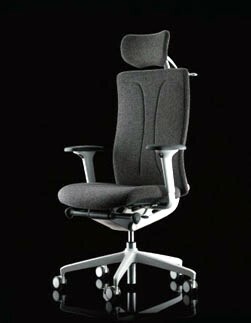 chair has been designed to morph to you, to flow, to work, to support, to change, to breathe with you. You could describe its motion as fluid, natural and balanced we think this is a good thing. It should, we believe do all this in a covert way rather than screaming look at me, it should do all this, all day, every day, instinctively. Fuse is the new universally applicable task and visitor seating range to be introduced by Senator. 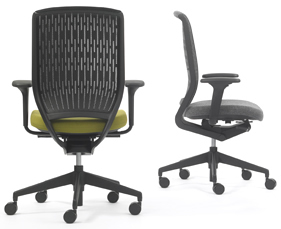 Evolve uses a new advance synchronised mechanism with enhanced geometry to ensure that the motion of the chair mirrors the natural pivot of the body. 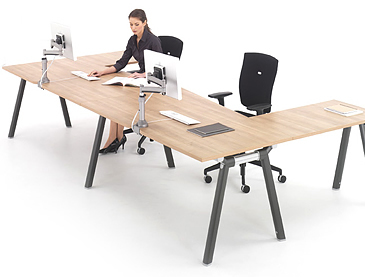 Core is a versatile desk system with a fresh clean aesthetic based around a horizontal beam construction. The flexibility designed into the system allows Core to provide a comprehensive range of different applications. Core is available as a four leg version, cantilever frame or continuous bench using simple, cost effective, flexible components and legs can be shared wherever necessary. At the heart of Crossover is a pair of horizontal beams which provide a robust structure and a continuous fixing method for all furniture elements. Legs, screens, wire management, work surfaces and accessories can be attached at any point along the beams regardless of the desk module, therefore saving a multitude of components. 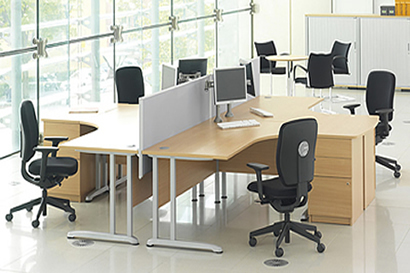 Aspen offers a straight forward range of shapes and sizes for the ever demanding office environment. Available in Beech, Maple and Oak MFC. Incorporating fly-over tops with wire management portholes and complementary storage pedestals. Soft and luxurious reception seating upholstered in top quality leather hides suitable for executive reception areas. Available as a single armchair, two or three seater settee with matching corner unit. 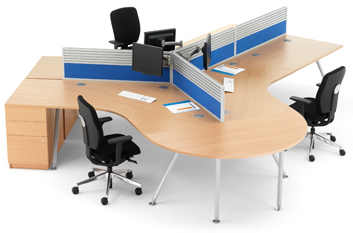 is a highly flexible, modular range of systems office furniture, which responds to the ever evolving way we work in offices. Pulsar has an optional retro fittable cable management kit that can be applied exactly where and when it is required. To support the most progressive technology, careful consideration has been given to varying levels of accommodation of power and data communication within the workstation. 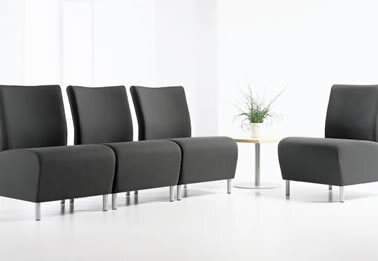 Conference Furniture is produced from the finest materials to cater for the most discerning buyer. 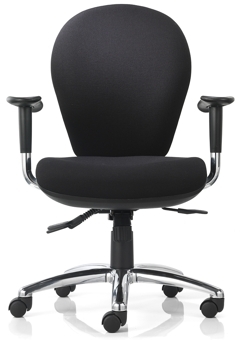 It conforms with BS4875 - Strength and Stability of Office Furniture; without losing its classical appearance. All tables with edge detail 1/2/3 are 38mm thick for strength and durability. Traditional tables are offered with a choice of four alternative solid hardwood edge profiles. Circular tables and edge detail 5 tables are manufactured from 36mm thick veneered MDF (Medium density fiber board). 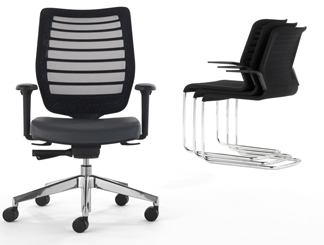 Executive L shaped office desk and leather office chair Freeflex F1511A and visitor chairs Freeflex F1623A. Accolade is manufactured to the highest specification for the most Senior Executives. It combines the lines of a traditional panel end system with the lightness of a profiled top and the curves of shaped tops. Accolade can be produced using re-engineered wood veneers which enables a degree of matching previously impossible with natural wood veneer species. All work tops have 36mm profile edge to relieve all the sharp edges. Designed for simplicity and ease of use with an understated style, Senator's new ‘Sprint’ chair is a competitively priced, high performance, high comfort task chair featuring a progressive synchro mechanism, seat slide and back height adjustment with optional height adjustable arms, representing the very best integration of style, function and value. The Enigma office chair is a truly universal chair program designed to provide comfort and support in all the right places for every body size and type. The Freeflex office chair features beautifully tailored soft upholstery with an over sewn edge, contained within anatomically shaped shells for the ultimate in comfort and support. 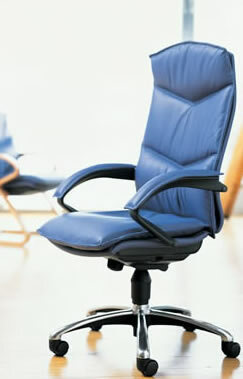 A special version with a laminated ‘S’ shape frame for conference or side chair use is also available in various finishes. Since it was first launched in 2001 Trillipse has proved to be the perfect seating solution for almost every occasion or application. Trillipse chairs can be stacked with or without arms or linked together without tools. They are available with finely sculptured beech wood or moulded plastic armrests on either four leg or cantilever base frames. An office is not something you can plan successfully from a catalogue. 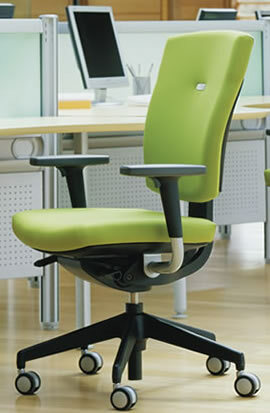 Every project is different whether it’s purchasing a new chair or carrying out a complete office installation. Our experience in designing office layouts lead to a successful installation with as little inconvenience as possible. Our planning service ensures your office space is designed to its maximum potential, creating a practical and attractive office environment. Call us today for a professional consultation or simply to discuss our extensive range of office furniture in Aberdeen by the UK's leading manufacturer Senator International. 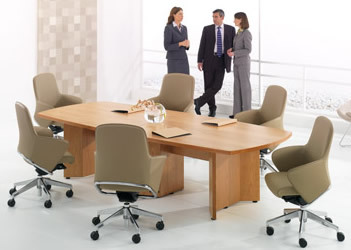 View the full range of office furniture Aberdeen in Beech, Maple, Oak MFC and veneer finishes, Senator office chairs finished in Camira fabrics or leather, computer operator chairs, orthopaedic chairs, boardroom table,conference table, desks, reception chairs, storage and much more by visiting the links in the menu on the left. Senator Office Furniture Aberdeen, UK. 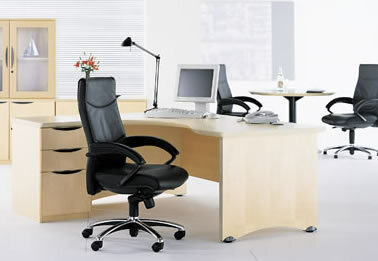 We do not supply second hand office furniture or used office furniture. 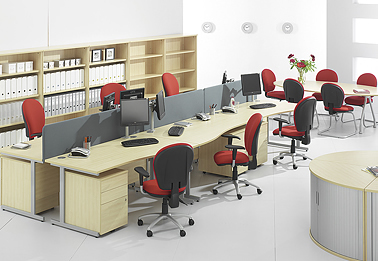 Senator have been supplying the market with office furniture Aberdeen for over 30 years and in recent years have invested heavily in research and development. 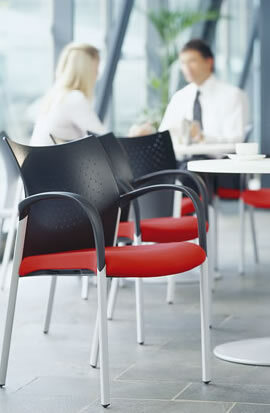 As a result they are continually launching new products across there Seating portfolio. Allermuir manufactures an extensive range of high quality, contemporary seating and tables for the contract market, designed by some of the most exciting and talented designers in the UK and Europe. Offering a comprehensive and diverse collection of products, Allermuir specialises in supplying furniture primarily for leisure and corporate environments, such as dining areas, cafes, breakout areas, reception areas , public spaces and bars. 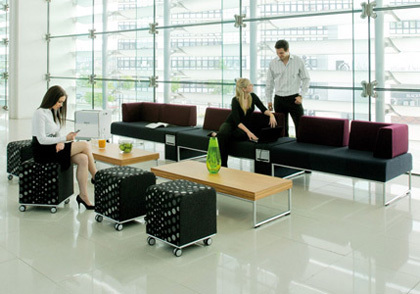 The Groups brand Torasen, offers an extensive range of functional, cost-effective office and leisure furniture.